Protoshapes, Inc. is highly regarded by its current clients as the best source for professional quality, cost-efficient short run parts. Get to know us better by browsing our website, then contact us by phone or email with your specific product questions. ProtoShapes, Inc. began operations in December 1996 to service companies that required rapid, short run production of small to medium sized plastic parts. Within a year, increased sales production necessitated relocation to a larger facility, equipment additions, and recruitment of production and office personnel. New equipment purchased during this phase included metering machines which automatically mix and inject Thermoset plastic into molds to produce parts. 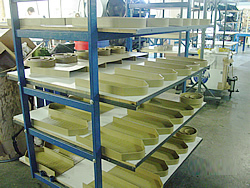 Through the years, ProtoShapes, Inc. has discovered unique alternative production methods by adapting these techniques to suit specific project requirements. Our ability to innovate is the key to success for many of our clients. Our client portfolio demonstrates the success of our processes and solutions. Long-term and repeat clients include Loud Corporation, JBL Professional, Spartan Motors, Douglass Autotech, ACO Polymer Products, Inc., Bernhardt Furniture, The Braun Corporation, Humphrey, Newmar Corporation, Marshall Excelsior, PreSonus and Thomas & Skinner. 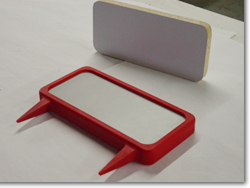 At ProtoShapes, Inc. we will always do our utmost to provide our customers the highest quality polyurethane plastic molds and parts possible at a cost-efficient price. As your company prepares to meet production and development budgets, polyurethane molds may be the ideal solution for an affordable end product. Tooling costs for polyurethane are minimal compared to hard tooling for Thermoplastics. Experience and technique enable our Tooling Technicians to build polyurethane molds, for the production of plastic parts, quickly and cost-efficiently. Whereas steel or aluminum molds, current industry standards, require months of production lead time. We are a company on the move, continuously expanding our company, availability of raw materials, staff of experts, and facility to aggressively address the growing needs of our clients. Our ability to produce short run (hundreds to thousands of parts in a week,) makes our service the ideal solution for companies requiring time and cost-efficient manufacturing of small parts. Let us assist you in finding the most beneficial methods of production for your short or long run parts! ProtoShapes, Inc. invites you to mail, email, fax plans or contact us by telephone to discuss your project. Please contact us for mailing instructions and email file format guidelines. We hope you will become a part of our success and allow us to contribute to yours!